Ms Pelosini is one of only a handful of Consultant Surgeons in the UK who is dual fellowship trained in Cornea & Anterior Segment and Medical Retina. 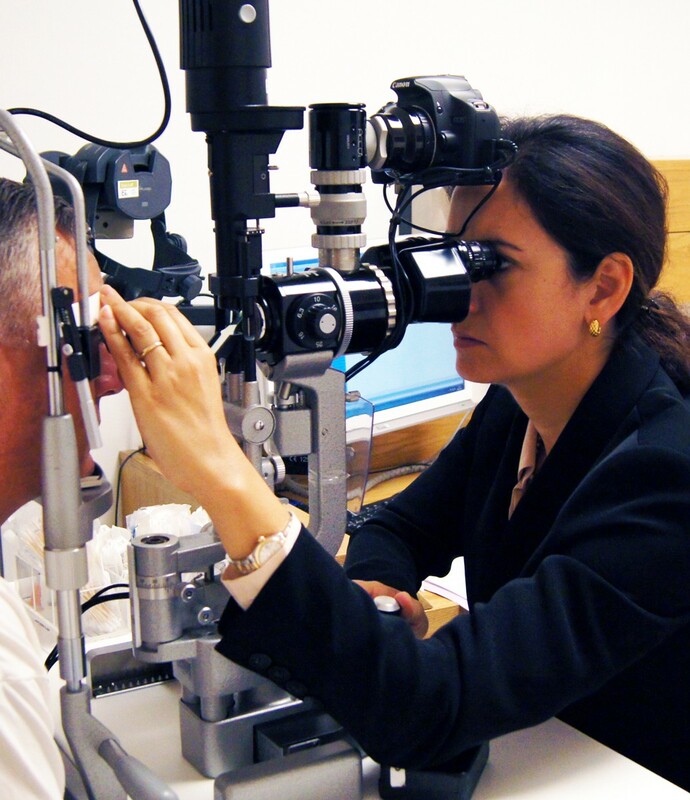 Ms Pelosini is the author of over 20 peer reviewed publications in prestigious international academic journals including Investigative Ophthalmology and Visual Science, Archives of Ophthalmology, Retina, the British Journal of Ophthalmology and Eye. She has conducted innovative research in macular imaging and novel sub-threshold laser treatment for diabetes and is regularly invited to present academic papers in national and international meetings. Ms Pelosini enjoys skiing in the winter; she is a keen gardener and plays tennis regularly. She enjoys classical music and attends the theatre and opera productions regularly. An Italian cooking enthusiast, she also plays piano in her free time. Lucia qualified from Pisa University Medical School with Honours in 1999. She completed her postgraduate training in Ophthalmology in London South Thames Training Programme working in a number of leading hospitals including King’s College Hospital and Guy’s & St Thomas’ Hospital. She then completed a Research Fellowship in Medical Retina at Moorfields Eye Hospital and obtained a MD (Doctorates of Medicine) Research degree at the University of London. Ms Pelosini also then completed her training with a Fellowship in Cornea, Cataract and Refractive Surgery at the Western Eye Hospital, Imperial College Healthcare NHS Trust in London. Lucia then continued her studies at Ulster University – Royal College of Ophthalmology Cataract and Refractive Surgery, where she graduated with a PostDip CRS Postgraduate Diploma. Ms Pelosini has been an examiner for King’s College London Medical School and an international instructor for Retinal imaging with Optical Coherence Tomography. Kirthi V, Tavare AN, Hoffman J, Pelosini L. A case of presumed post-traumatic pneumocephalus. BMJ Case Rep. 2015 Oct 29. L Pelosini, HB Smith, JB Schofield, A Meeckings, A Dhital, M Khandwala. A novel imaging approach to periocular basal cell carcinoma: in vivo optical coherence tomography and histological correlates. Eye (Lond). 2015;29(8): 1092-98. L Pelosini, HB Smith, JB Schofield, A Meeckings, A Dhital, M Khandwala. In Vivo optical coherence tomography (OCT) in periocular basal cell carcinoma: correlations between in vivo OCT images and postoperative histology. Br J Ophthalmol 2013 July;97(7):890-4. L Pelosini, R Hamilton, M Mohamed, AP Hamilton, J Marshall. Retina rejuvenation therapy for diabetic macular oedema: a pilot study. Retina 2013, March;33(3):548-58. ST Nagendran, C Pawlyn, M Brown, L Pelosini. Crystalline keratopathy associated with monoclonal gammopathy of undetermined significance. Br J Haematol 2012;159(3):258. L Pelosini, CC Hull, JF Boyce, D McHugh, M Stanford, J Marshall. Author response: predictors of visual acuity in macular oedema. IOVS 2012;53(2):924. L Pelosini, CC Hull, JF Boyce, D McHugh, M Stanford, J Marshall. Optical coherence tomography may be used to predict visual acuity in patients with macular oedema. IOVS 2011;52(5):2741-8. SN Rajak, MD Mohamed, L Pelosini. Further insight into west african crystalline maculopathy. Arch Ophthalmol 2009;127(7):863-8. B Gupta, J Grewal, T Adewoyin, L Pelosini, TH Williamson. Diurnal variation of macular oedema in CRVO: prospective study. Graefes Arch Clin Exp Ophthalmol 2009;247(5):593-6. L Pelosini, S Treffene, EJ Hollick. Antibacterial activity of preservative-free topical anaesthetic drops in current use in ophthalmology departments. Cornea 2009;28(1):58-61. L Pelosini, EC Richardson, R Goel, C Hugkulstone. Intraoperative breakage of the mushroom manipulator tip during phacoemulsification. Eye. 2006;20(12):1451-2. L Abu-Safieh. EN Vithana, I Mantel, G Holder, L Pelosini, AC Bird, SS Bhattacharya. A large deletion in the adRP gene PRPF31: evidence that haploinsufficiency is the cause of disease. Mol Vis 2006;12:384-8. EN Vithana, L Abu-Safieh, L Pelosini, E Winchester, D Hornan, AC Bird, DM Hunt, SA Bustin, SS Bhattacharya. Expression of PRPF31 mRNA in patients with autosomal dominant retinitis pigmentosa: a molecular clue for incomplete penetrance? IOVS 2003,44:4204-4209.